"Sweet Mountain" redirects here. For the DS version of the stage, see Sweet Mountain (DS). 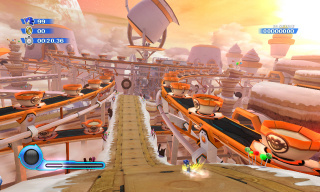 Sweet Mountain is the second stage of Sonic Colours for the Wii. One of the planetoids captured in Dr. Eggman's Amazing Interstellar Amusement Park, the Doctor is building the area up as some kind of crazy fusion between a bakery and a military-industrial complex. Loop-the-loop round giant artificial doughnuts, dodge jellybean-fuelled rockets, and keep an eye out for the chefs-hat-sporting Egg Pawns; they pack a mean punch with their oversized whisks. The Yellow Wisp sees a lot of use here, drilling through spongecake floors to access the secret areas below. This was one of the first two levels of the game (the other being Tropical Resort) to be revealed. Information about the stage was first released in a featured Nintendo Power article. Sweet Mountain, as the name implies, is made of sugary baked goods such as cake, donuts, and pancakes, as well as other snacks. After smashing Rotatatron in Tropical Resort, Sonic is free to move on to either Starlight Carnival or Sweet Mountain second. Sweet Mountain Act 1 introduces the player to drifting and the Yellow Wisp. There are plenty of areas to explore underground, including a small room containing one of the Red Rings. Clearing this act unlocks the Yellow Wisp for all stages, which enables Sonic to use the Drill Color Power. Sweet Mountain Act 2 opens up with a 3D section that includes a Quick Step area followed by a drifting area. Then the main part of the level sees Sonic circumnavigate a massive hamburger tower, much like the giant tree in Savannah Citadel Day Act 3 of Sonic Unleashed. Two of the Red Rings in this act can only be reached by using the Green Wisp. 1* Use Hover to glide downward without taking damage. 2* (update soon) 3* (update soon) 4* (update soon) 5* Slide under and take the spring to the grind rail. Sweet Mountain Act 3 introduces the player to the Orange Wisp. There are more drifting sections, and during 2D sections, Sonic must avoid the jellybean rockets that are plummeting toward the surface. These can easily knock Sonic into a bottomless pit, so timing is key for clearing this act. Upon clearing it, the Orange Wisp will now be unlocked for all stages it appears in, allowing Sonic to use the Rocket Color Power. Sweet Mountain Act 4 takes place entirely in 2D. This act is focused around switches that cause obstacles and platforms to move, allowing Sonic to progress through the stage. One of the Red Rings here can only be reached by using the Purple Wisp. Sweet Mountain Act 5 starts a few yards away from where Act 4 began. Sonic runs and dashes off a ramp and the 3D area is a quick-step area, then an area of three robots that have to be defeated before Sonic can continue. The rest of the act, using spikes and cube is on you. Sweet Mountain Act 6 takes place entirely in 2D and makes use of reviving blocks and blue blocks to create puzzles in which the player must utilize the Pink Spike and Blue Cube Color Powers to find the Red Rings hidden in-between the blocks. This page was last edited on 6 March 2018, at 07:41.